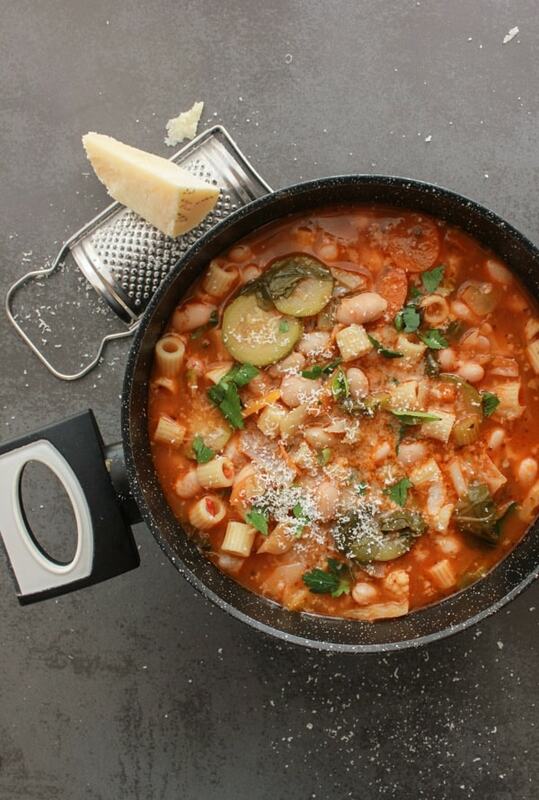 Italian Vegetable Soup, the perfect winter time comfort food. Full of yummy veggies and just the right amount of pasta. A delicious Family Dinner Recipe. To start off I would like to wish anyone who is celebrating Thanksgiving tomorrow a very Happy day! Whether you are eating Turkey and Stuffing, mostly Veggies or any and all Pies, I hope you enjoy it all surrounded by family and friends. Remember eat slowly and enjoy every mouthful! Now back to the Italian Vegetable Soup.To tell the truth I actually had my American friends in mind when I decided to post this soup. Because I imagined after all that glorious food, soup might just be what you needed for a few days after. 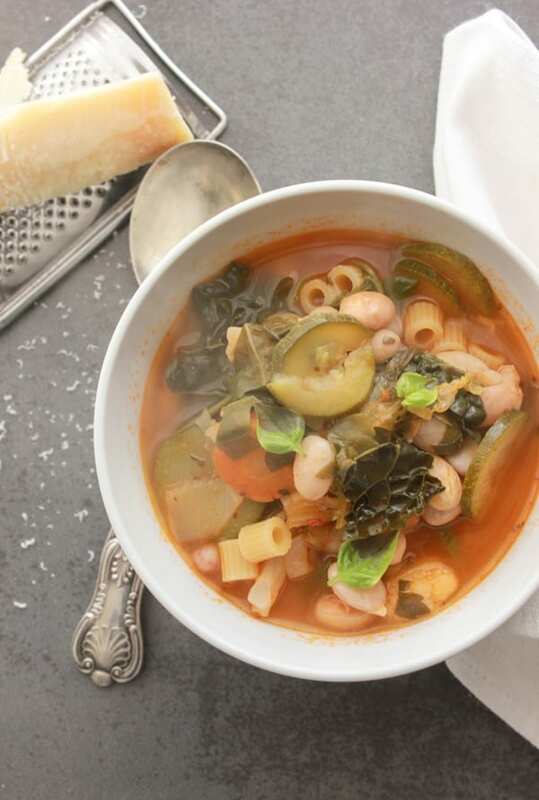 And nothing’s better than some hearty good-for-you vegetable soup. 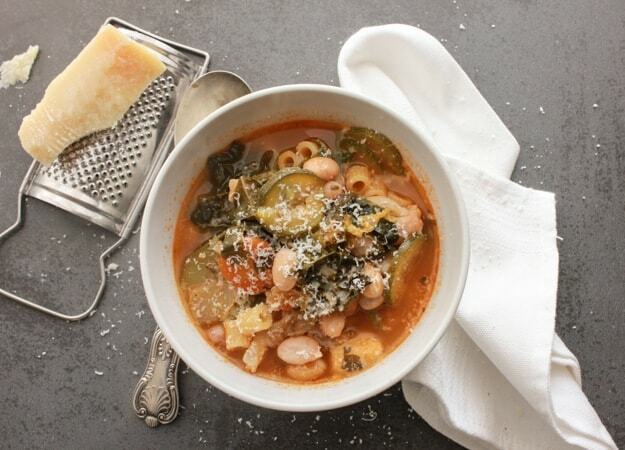 I make this soup at least once a week, forget the meat, sprinkle with lots of Parmesan cheese if you like and serve with some crusty Italian bread, nothing could be better. I could call it my personal detox soup. 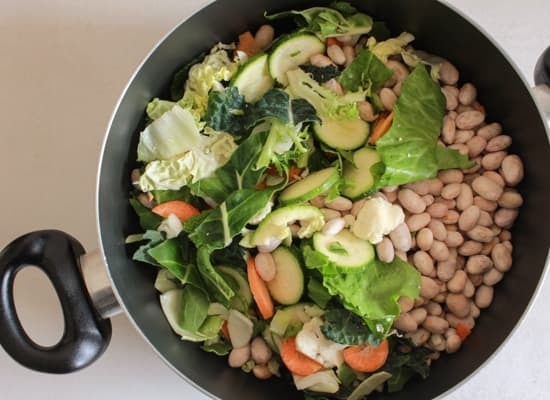 I make a big pot, I add chopped kale, cabbage, carrots, zucchini, celery, broccoli and borlotti beans. We eat it at lunch and finish it up at dinner. Or you could have it for dinner and leave the leftovers for the next day. 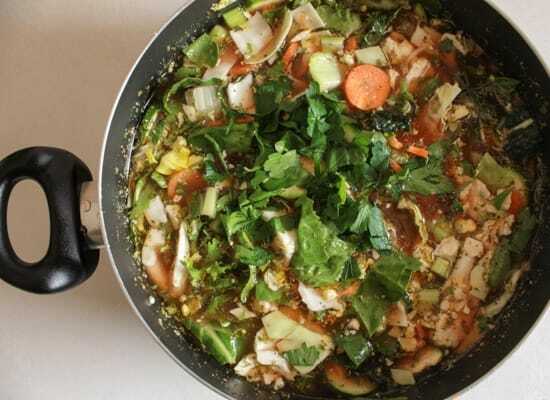 Believe me it tastes even better after all those amazing vegetables and spices linger together. Buon Appetito! 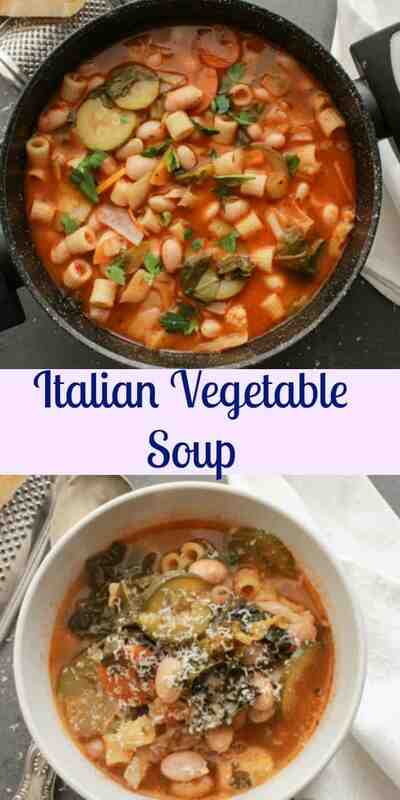 Italian Vegetable Soup, a delicious good for you full of veggies soup recipe, fast, easy,vegan and vegetarian the perfect comfort food soup. 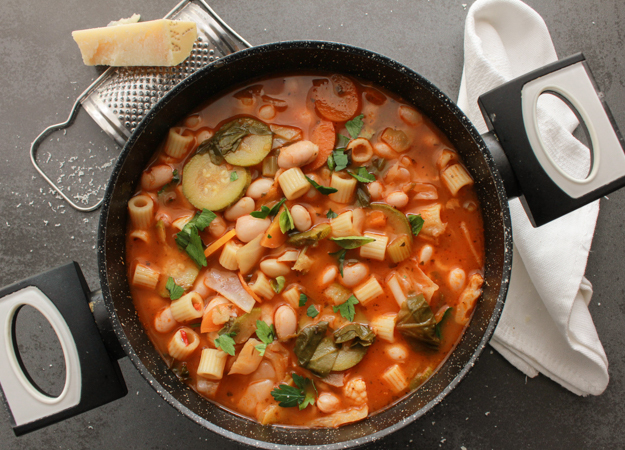 In a large pot add olive oil, garlic, vegetables, beans, spices, tomato purée, water and bouillon cube, stir to combine, bring to a boil and then turn heat down to simmer for approximately 30-45 minutes or until beans are tender (halfway through taste for salt). I would advise making your pasta separately in a pot of boiling salted water and then adding it to the soup (if you are keeping half the soup for later consumption then make half the pasta and only add it to the soup you will be eating or the pasta will get mushy). Enjoy! **Dried soaked bean are fine too, they may take longer to cook. I have made this soup 5 times in 4 weeks. I’ve added sausage once, I always add kale and sometimes Brussels sprouts. I’ve used beef broth, vegetable broth and chicken broth. I’ve added chicken. I make extra broth, it’s our favorite part. Lots of garlic and seasonings. It’s so delicious thank you! I’ve also made a few of your desserts and cookies and I love them all. I just ordered your cookbook as a thank you and so I will have your dessert recipes handy. I hope you make another cookbook, thank you for posting all of your family recipes. Hi Karee Sue, thanks so much, so glad you love the soup, and I love the additions you made and thank you for ordering the book, I hope you enjoy it. Happy New Year. why do the beans have to be frozen? I’m making this tonight! Always enjoy every recipe you post as I miss having you in my kitchen. 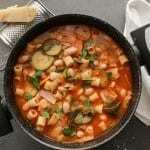 What is equivalent to borlotti beans for your American Friends? Hi Robin, Borlotti beans are available in the US but I also heard they are sometimes called Cranberry beans or Horticultural Beans. Hope that helps. Have a great day.